METAIRIE, La. (AP) — In his 18th NFL season and less than two months from turning 40, Saints veteran quarterback Drew Brees has exhibited a knack for connecting with young people recently. Or, to be more specific, the young receivers on New Orleans’ roster. Brees’ four touchdown passes last week to four former undrafted free agents , who’d all turned pro within the past three years, was the latest instance of what has been an increasingly encouraging sign for New Orleans during its 10-game winning streak. Relatively young, inexperienced receivers are winning their record-setting QB’s trust and getting in the end zone. Four Saints have caught their first career touchdowns this season, among them: receivers Tre’Quan Smith, Austin Carr and Keith Kirkwood, and tight end Dan Arnold. Smith, a third-round selection out of mid-major UCF, is the only one among them who was drafted. The 6-foot-6, 220-pound Arnold was a Division III college receiver who has been transformed into an NFL tight end since turning pro in 2017, but never played before this season. The 6-3 Kirkwood, who spent most of his youth focused on basketball, didn’t start playing football until his senior year of high school and was signed as an undrafted rookie out of Temple. Carr is in his second season after being undrafted out of Northwestern. He played in one game last season without a catch. All of them have played prominent roles in the Saints’ offense in recent weeks, along with Smith, who two games ago caught 10 passes for 157 yards and a touchdown. “It’s really cool just to look back and think of how far you’ve come,” he said. Arnold was inactive the first four games and made his first two catches at Baltimore in Week 7. He then caught two passes apiece against Cincinnati and Philadelphia before his career-high four catches for 45 yards and a TD last week against Atlanta. Kirkwood made a diving catch on a low throw for his maiden TD, something he said he never envisioned when he was playing youth basketball with or against players such as Karl-Anthony Towns, Wade Baldwin, Malachi Richardson and Deandre Bembry, who all wound up in the NBA. Kirkwood now has six catches, including a 42-yarder against the Bengals. Carr has played all season and has just nine catches for 97 yards, but his touchdowns of 3 and 12 yards in the past two games indicates the confidence the Saints have in him in red-zone situations, when defenses are keying on the Saints’ more established skill players such as receiver Michael Thomas and running back Alvin Kamara. 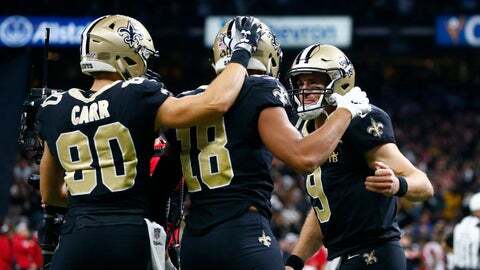 Kirkwood said greener Saints receivers have developed chemistry with Brees quickly because they regard him as a “football guru” whose lead they are eager to follow. Arnold credited Brees’ hands-on approach to developing potential targets. Notes: Saints LT Terron Armstead remained out of practice with a pectoral injury that as caused him to miss the past two games. … Arnold (chest), Smith (toe), defensive end Marcus Davenport (toe), kicker Wil Lutz (back), guard Andrus Peat (shoulder) and defensive back P.J. Williams (hip) all practiced on a limited basis.